If you’ve been to my main website under enjoying coffee, you would have seen that I was excited about the cafe scene in Cape Town. In any case, I’ve been lucky enough to visit Cape Town twice in the last 4 months and thought that I’d share my experiences with you, but this time with pictures. 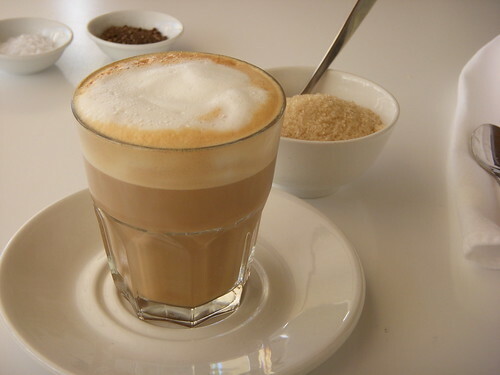 I noticed that when goggling (doesn’t that sound and look weird) coffee shops in Cape Town, a writer boasted that a new Eatery called Manna Epicure on 151 Kloof Street had the best cappuccinos in Cape Town. 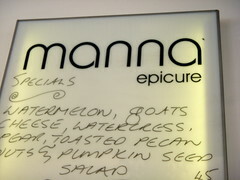 So always up to the challenge, I made sure that on my next visit, I would make a “beeline” for Manna Epicure, which turned out to be more like a marathon, as it was way up on the hill of Kloof Street. Needless to say, by the time I got there I was starving, having turned down the free breakfast at my hotel. The restaurant is a bit small and to be quite honest, I think it was converted from a bungalow. It has an all white decor inside, including white tables, chairs, floorboards and displays and a chandelier. There’s an outside bit, where I sat, which is like a balcony. To eat, I had their signature dish, scrambled eggs on coconut bread (delicious) and of course, I ordered a cappuccino. Turned out that they get their coffee from Origin Coffee Roasting Cafe (more of that to come later) – Anyway the coffee wasn’t bad, but I think it was more like a caffe latte than a cappuccino – I promptly got my camera out and took a few snaps – of course I got some weird looks, but hey ! you’ve got to seize the moment and what a lovely picture it is, below. They also had some lovely cakes on display and although the three layer carrot cake and white icing fairy cakes looked gorgeous, I just didn’t have any space in my stomach for more – perhaps for the next visit, God willing. Also on Kloof Street, there is Melissa’s, packed with expensive delicacies like jams, preserves, biscuits, nuts, vinegars and imported European stuff. There’s also a small corner to have cakes and coffee, which I haven’t tried out yet. Still with Kloof Street, there’s a newish place called Caramellos, where you can pick up some wonderful Greek/Italian confectionery – the manager was really nice and on hearing my British accent, he was inspired to give me some lovely biscuits – Again ! no time to taste the coffee, but a nice venue nevertheless. Quite popular with the young and trendy of Cape Town is also Vida e Caffe, with sites springing up around Cape Town, however on this occasion I tried the one on Kloof Street. The cafe was small, but it has a buzz and you can tell that the customers are regulars. Concerning the quality of the double espresso I ordered, it was OK and the crema was gone in less than one minute, so it’s a good place to hang out. 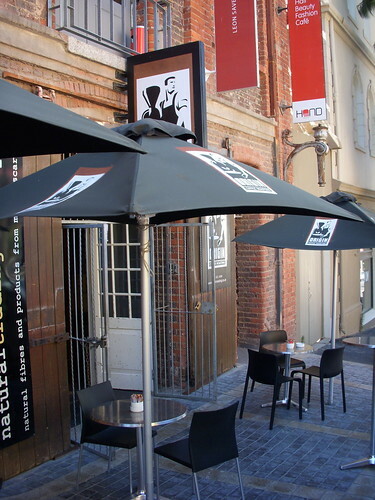 On another of Cape Town’s fashionable streets, Long Street , there’s RCaffe – where I got to sample a medium sized cappuccino after about a week of bad coffee in a neighbouring country. The milk was frothed well and the coffee was good. RCaffe is also like an all day deli, where they serve small lunches, cakes, pastries, etc. The art displayed on their walls are also for sale and the clientele was quite mixed, with young and trendy, mixing with the older generation. 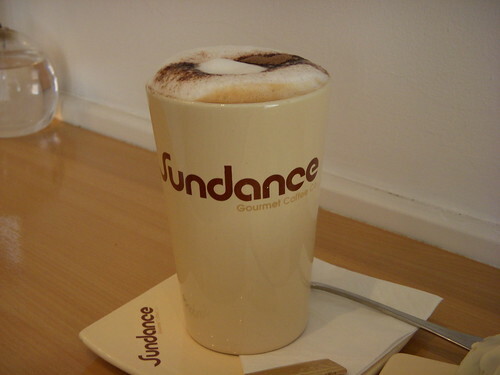 My second favourite cafe in Cape Town has to be Sundance, which have now added branches in centrally located Church Street and at Greenpoint (where they have live Jazz) to their original shop in Buitengracht Street. 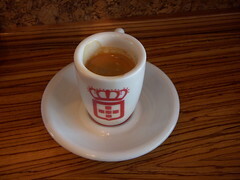 They try and make their shops unique – so for example at their first ever shop in Buitengracht Street, they have a La Marzocco machine, which the barista knew how to use, judging by the sweet and sharp espresso I got from him on a sunny Friday afternoon. The decor is warm with light brown colours and a huge mirror. At their Church Street branch, keeping with the warm comfy colours, the shop is quite small, with bar stool type chairs and their machine is an Elektra. On my visit to this shop I tried a large cappuccino, accompanied with a lovely carrot muffin, but afterwards I came to judge that to really get the best from the type of coffee you prefer, you need to try it in the original size and not these massive versions. I think I read somewhere that in Italy they only serve one size of coffee, except of course for espresso. So for example if you went to Italy and ordered an extra large caffe latte, they would really think you were mad and probably say no ! Anyway I digress, back to Cape Town cafes. If you do visit Cape Town, you will no doubt be drawn to the tourist magnet, the V&A Waterfront, which has a lovely array of shops, restaurants and cafes, as well as the nearby Two Oceans Aquarium. As with most tourist traps unfortunately, it is always hard to get a really well prepared cup of coffee. You will no doubt be confirnted with many choices such as another branch of Vida e Caffe, Coffee and Bites, Love Revenge (strange name for a cafe) and Mugg & Bean (South Africa’s Starbucks), but I think when you are here, you should go for atmosphere and scenery and I don’t think there’s anywhere better than at Balducci’s, advertised as a Cafe, restaurnat and Royal sushi Bar (OK !). 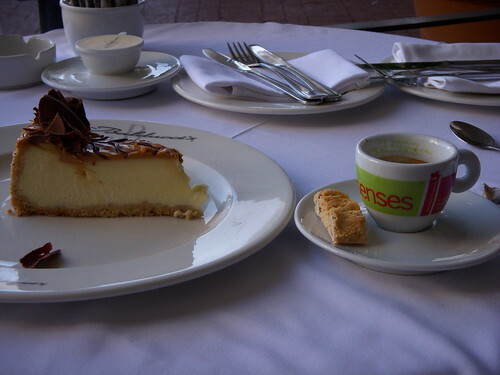 At Balducci’s, if you get a seat, ask for one outside, so that you can be sipping your cappuccino or espresso with a view of Table Mountain and that’s exactly what I did, where I took this picture of an Illy espresso macchiato and lovely caramel cheesecake. I’ve saved the best for last and for me, there’s no doubt however that my favourite coffee shop in Cape Town and probably the World is Origin Coffee Roasting on 28 Hudson Street in de Waterkant area. On the website, I wrote a glowing report about my experience, so I wont’ go into similar details here. In any case, Origin is in keeping with their name – the Artisan Coffee Roasters of Africa. They now have a barista training school and are providing coffees to restaurants and other cafes (like Manna Epicure on Kloof Street), needless to say their coffee is of course superb, having won the 2007 and 2008 South Africa Barista Championships but I’ll say more on them in a future post – after all, they should get a special post as they are my favourite and this post is already getting quite long. Cape Town Coffee Scene – highly recommended ! This entry was posted on Monday, February 25th, 2008 at 6:06 pm	and posted in Bean There - Cafes. You can follow any responses to this entry through the RSS 2.0 feed.